What’s the difference between camping and glamping? For your adventurous guests, this question is easy to answer: Campsites just need to offer a place to pitch your tent. Some might offer electrical hookups too. But beyond that, a campsite doesn’t have to offer much in the way of amenities. And that’s fine. For some, camping is all about getting closer to nature and roughing it for a few days. But glamping can be something else entirely. If you claim to offer glamping, your guests will expect so much more. In fact, if you want to turn your campsite into a glampsite, it seems you need to offer all the comforts of a boutique hotel without quite losing the rough-and-ready feel of a rustic campsite. Is this possible? Yes, and it’s easier than you think. But is it worth it? Absolutely. Let us explain why. Camping vs. Glamping – Which Is More Profitable? 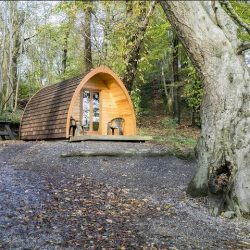 We’ve surveyed 50 UK campsites and 50 UK glamping sites listed on one of the UK’s largest camping directories. We wanted to find out the average minimum amount charged by a campsite compared to the average minimum amount charged by a glampsite. For campsites, we looked at nightly rates for a single pitch with no electrical hookup. We found that the average minimum charge is £13 in low season and £17 in high season. When it comes to glamping, the charge usually depends on the nature of the accommodation. A bell tent invariably costs less per night than a log cabin, for instance. But again we looked at the nightly rates, and found that the average minimum charge is £61 in low season and £70 in high season. So Is It Worthwhile for Campsite Owners to Make the Upgrade to Glamping? Considering that customers are happy to pay 369% more per night in low season and 312% more in high season, then it’s fair to say that the upgrade will pay for itself in no time. But don’t take our word for it. Phil Bicknell, the Head of Farming at the National Farmers Union, says that farms that have diversified into glamping can achieve extra incomes of about £21,000 per year. Also, Jackie Jewel from Classic Glamping claims she makes up to £15,000 net profit per safari tent. All evidence suggests that, no matter how large your initial investment, making the upgrade to a glampsite pays. What Do Visitors Want From A Glampsite? Indeed, leading glamping experts seem to agree that a glampsite may only be as good as its showering facilities. We spoke to independent glamping advisor Kate Morel, who believes that showers are becoming increasingly important to the glamping experience. How Easy Is It To Provide Your Glamping Guests With Showers? It all depends on the nature of the accommodation you’re offering, but it’s much easier than you think. If you’re working with bell tents and safari tents, you’ll likely have to invest in a shower block. But with premium shower cubicles supported by compact and efficient pumps, you’d be amazed at how quickly and easily you can start offering luxurious showering facilities to your guests. Get in touch for more information and a free quote. But the most premium – and by extension, most profitable – glamping experiences offer guests the luxury of private showering facilities within the glamping accommodation itself. We have a history of working with glampsites to make this once-unthinkable idea a reality. We’ve worked with English Shepherd Huts, MRC Modular and The Log Pod to create luxurious showers for luxurious glamping. All the signs indicate that hot showers are becoming the expected-norm for glampsites. So don’t fall behind – talk to us and we’ll show you how to offer a truly unforgettable glamping experience. Header image: Rossographer, licensed for reuse under this Creative Commons Licence.